Happy World Dulce de Leche Day!! We are celebrating with a simple sweet treat. Cocadas are a type of coconut confection found throughout Latin America. Mounds of soft and chewy coconut held together with sweetened condensed milk are pretty good, but adding some dulce de leche takes these treats to the next level. These are super simple to make; essentially it’s mix, stir and bake. Easy as a boxed cake mix. For an added touch, dip the cocadas in a little bit of melted chocolate. Make a dozen, or make 12 dozen, these little guys are even better when shared with your loved ones. In a large mixing bowl, combine all the ingredients until fully incorporated. Chill in your refrigerator for about 30 minutes. Meanwhile preheat your oven to 350°F. Line a cookie sheet with parchment paper and spray lightly with non-stick spray. 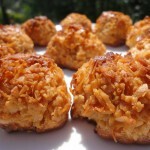 Roll your coconut mixture into small balls. Stick with 1-2 oz balls. Place them on the prepared cookie sheet, evenly spaced. They don’t spread. If it gets too sticky you can lightly wet your fingertips. Bake for 30-35 minutes, rotating half-way through baking. Allow to cool completely. Store in an air tight container.